On December 16th, South Africans celebrate the Day of Reconciliation, a public holiday that commemorates two significant events, both of which helped to shape the country's history. The most recent of these was the formation of Umkhonto we Sizwe, the military arm of the African National Congress (ANC). This took place on December 16th 1961, and marked the beginning of the armed struggle against apartheid. The second event happened 123 years earlier, on December 16th 1838. This was the Battle of Blood River, waged between the Dutch settlers and the Zulu warriors of King Dingane. When the British colonized the Cape in the early 1800s, Dutch-speaking farmers packed their bags onto ox-wagons and moved out across South Africa in search of new lands beyond the reach of British rule. These migrants became known as Voortrekkers (Afrikaans for fore-trekkers or pioneers). Their grievances against the British were stipulated in the Great Trek Manifesto, written by Voortrekker leader Piet Retief in January 1837. Some of the main complaints included the lack of support given by the British in terms of helping the farmers to defend their land from the Xhosa tribes of the frontier; and the recent law against slavery. At first, the Voortrekkers met with little or no resistance as they moved northeast into South Africa's interior. The land seemed bereft of tribespeople - a symptom of a far more formidable force that had moved through the region ahead of the Voortrekkers. Since 1818, the Zulu tribes of the north had become a major military power, conquering minor clans and forging them together to create an empire under the rule of King Shaka. Many of King Shaka's opponents fled to the mountains, abandoning their farms and leaving the land deserted. It was not long however, before the Voortrekkers crossed into Zulu territory. Retief, at the head of the Voortrekker wagon train, arrived in Natal in October 1837. He met with the current Zulu king, King Dingane, a month later, in order to try and negotiate ownership of a tract of land. According to legend, Dingane agreed - on the condition that Retief first recovered several thousand cattle stolen from him by a rival Tlokwa chief. Retief and his men successfully retrieved the cattle, delivering them to the capital of the Zulu nation in February 1838. On February 6th, King Dingane allegedly signed a treaty granting the Voortrekkers land between the Drakensberg Mountains and the coast. Shortly afterwards, he invited Retief and his men to the royal kraal for a drink before they left for their new land. Once inside the kraal, Dingane ordered the massacre of Retief and his men. It is uncertain why Dingane chose to dishonor his side of the agreement. 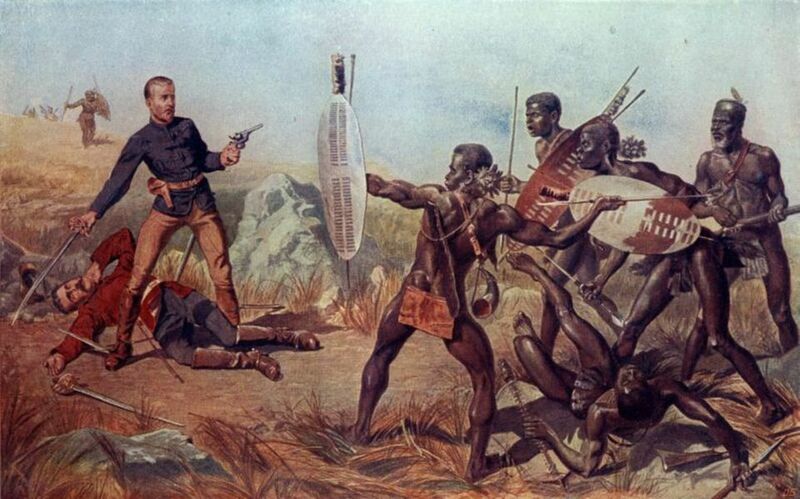 Some sources suggest that he was angered by Retief's refusal to hand over guns and horses to the Zulu; others suggest that he was afraid of what might happen if Voortrekkers with guns and ammunition were allowed to settle on his borders. Some believe that Voortrekker families had begun to settle on the land before Dingane signed the treaty, an action that he took as evidence of their disrespect for Zulu customs. Whatever his reasoning, the massacre was seen by the Voortrekkers as an act of betrayal that destroyed what little faith there had been between the Boers and the Zulu for decades to come. Throughout the rest of 1838, warfare raged between the Zulu and the Voortrekkers, with each determined to wipe out the other. On February 17th, Dingane's warriors attacked Voortrekker camps all along the Bushman's River, slaughtering over 500 people. Of these, only around 40 were white men. The rest were women, children and black servants traveling with the Voortrekkers. The conflict came to a head on December 16th at an obscure bend on the Ncome River, where a Voortrekker force of 464 men were encamped on the bank. The Voortrekkers were led by Andries Pretorius and legend has it that the night before the battle, the farmers took a vow to celebrate the day as a religious holiday if they emerged victorious. At dawn, between 10,000 and 20,000 Zulu warriors attacked their circled wagons, led by commander Ndlela kaSompisi. With the benefit of gunpowder on their side, the Voortrekkers were able to easily overpower their attackers. By midday, over 3,000 Zulus lay dead, while only three of the Voortrekkers were injured. The Zulus were forced to flee and the river ran red with their blood. Following the battle, the Voortrekkers managed to recover the bodies of Piet Retief and his men, burying them on December 21st 1838. It is said that they found the signed land grant amongst the dead men's possessions, and used it to colonize the land. Although copies of the grant exist today, the original was lost during the Anglo-Boer War (although some believe it never existed at all). There are now two memorials at Blood River. The Blood River Heritage Site includes a laager or ring of cast-bronze wagons, erected on the battle site to commemorate the Voortrekker defenders. In November 1999, the KwaZulu-Natal premier opened the Ncome Museum on the east bank of the river. It is dedicated to the 3,000 Zulu warriors who lost their lives and offers a re-interpretation of the events leading up to the conflict. After liberation from apartheid in 1994, the anniversary of the battle, December 16th, was declared a public holiday. Named the Day of Reconciliation, it is meant to serve as a symbol of a newly united South Africa. It is also an acknowledgement of the suffering experienced at various times throughout the country's history by people of all colors and racial groups.